I’ve two reasons for removing the fingerboard. I have always planned to veneer the top of the body to ensure that the plugged post holes and humbucker plugs never show through the paintwork. Otherwise, these modifications will eventually reveal themselves once the lacquer has cured and starts to shrink back. 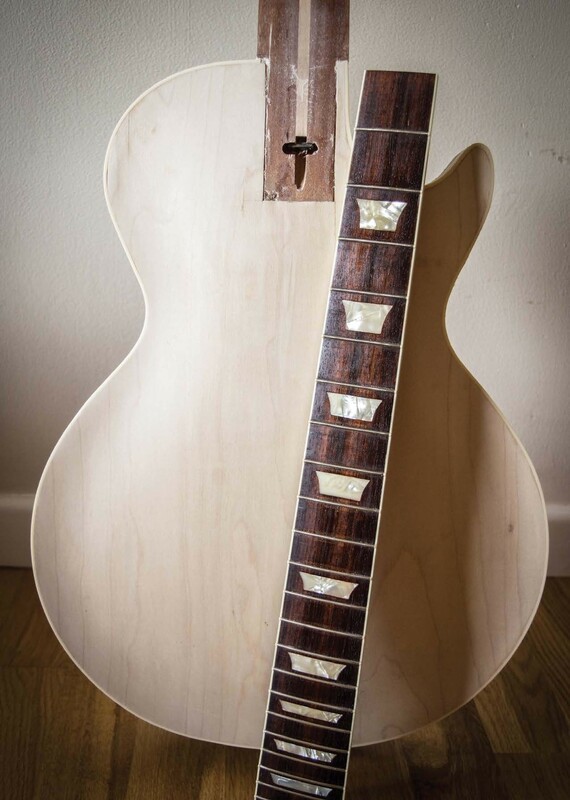 Applying a veneer over the guitar’s top is one way to ensure that this never happens. 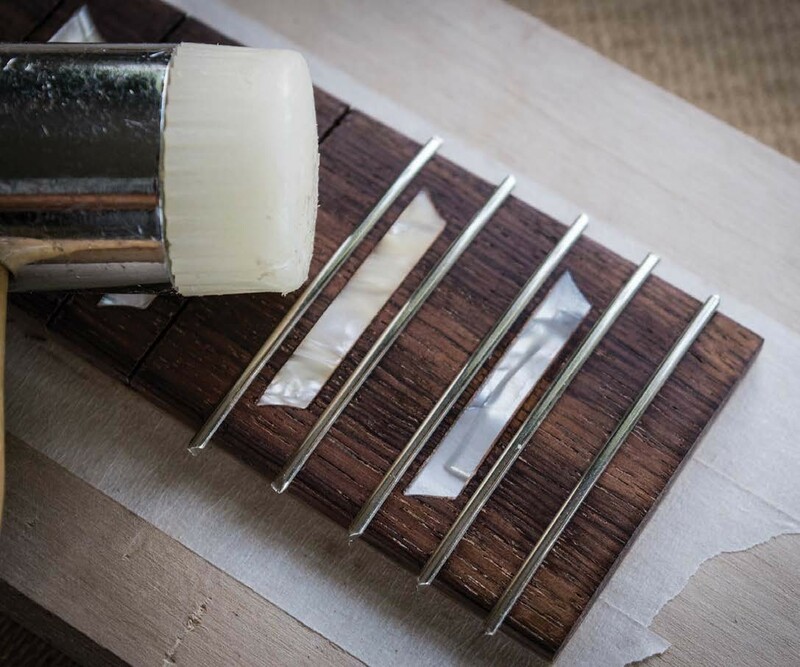 Although it is possible to veneer around the fingerboard, things could get messy and had the original binding survived the paint stripping process, I’d be left with the problem of transitioning from the veneer level to the binding level to reveal it. That’s something I’m not even prepared to contemplate. The February 2018 issue of The Guitar Magazine is on sale now and it comes packed with guitars, stars, pro tips and sure-fire ways to make you a better player. 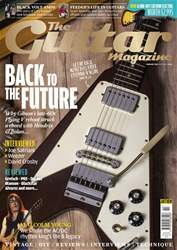 Inside we salute the rhythm guitar genius of the late AC/DC star Malcolm Young, catch up with bona fide legends David Crosby and Joe Satriani, go on the road with Weezer and take a close look at the guitars and basses with which Feeder’s Grant Nicholas and Taka Hirose built a 25 year career in rock. In the most in-depth gear reviews section in the business, we put a raft of hot new products to the test from PRS, Gretsch, Blackstar, Manson Guitar Works and more, and get the inside track on LA’s hottest new boutique amp brand, Black Volt Amplification. Elsewhere, Huw Price continues his conversion project in DIY Workshop as his old Greco takes a step closer to becoming a ’54 style Goldtop and in Vintage Bench Test, we find out what Marc Bolan and Jimi Hendrix loved so much about Gibson’s late 1960s reboot of the Flying V. As if that wasn’t enough, you can also find out how to win a one-off custom-built electric from Brit brand Haynes Guitars worth a massive £2,995, which also features House Of Tone pickups and a wiring harness from James’ Home Of Tone. For all that and much more, get your print or digital copy of the February 2018 issue of The Guitar Magazine now.